This post is about the Belgrade to Bar train. Also called the Montenegro express. I love trains, but the train network in the Balkans is not very good. Trains are slow with frequent delays. Locals prefer to take buses that are quicker and more convenient. The Belgrade to Bar train takes 11 hours for the 321 kilometer long journey. However, the nostalgic Montenegro express from Belgrade to Bar winds through spectacular mountains with scary roads. The Belgrade to Bar train is considered to be the most beautiful train journey in Europe. Therefore the Montenegro express was on my bucketlist for a long time when I finally decided to take the Belgrade to Bar train with a friend. 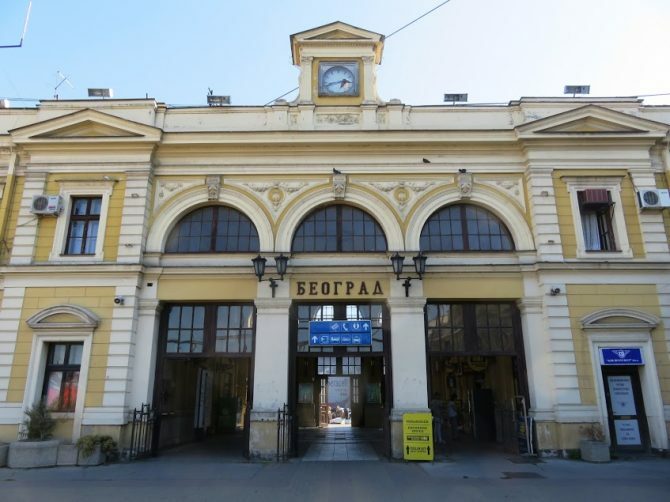 How to book tickets for the Belgrade to Bar train? We looked everywhere, but came to the conclusion that it was impossible to book tickets for the Montenegro express online, except by contacting a certain mister Popovic. It was summer and we ware scared that the Belgrade to Bar train might be full, so I sent an e-mail. I didn’t hear from him for weeks when I got instructions to send my credit card details in seperate e-mails. Obviously I was skeptic, but internet sources assured me of his trustworthiness. The next e-mail told me we could pick up our tickets for the Montenegro express at a kiosk near the station the day before our departure. We never saw the mysterious mister Popovic, but the small kiosk selling sigarettes and snacks indeed had an envelope with our tickets for the Belgrade to Bar train. Everything was in order and we even got a free upgrade to the first class. The day of my journey on the Montenegro express it was a hot day in Belgrade with temperatures rising above forty degrees Celsius. I was not concerned with my first class tickets that promised me fluffy seats in an airconditioned coupé. We bought drinks and delicious Serbian cheese pita’s and we were set to go. Montenegro express: Europe’s most beautiful train ride? Was it really Europe’s most beautiful train ride? Let me start with saying that being stuck on a train that frequently broke down and whose airconditioning kept going on and off during a heat wave does not make for a pleasant journey. But then, comfort was not the reason I took the train in the first place. Tito opened the line in 1976 and used it to travel accross the Dinaric Alps to Montenegro’s coast. The Montenegro express crosses 435 bridges and passes through 254 tunnels. The old trains are still being used and even the first class is no fancy affair. For some, the Montenegro express still offers the most affordable way to get from Belgrade to Bar, even though the train takes its sweet time. 11 hours if you are lucky, but more if the train breaks down. My fellow passengers told me this was a common occurence when we were once more standing still in the middle of Serbian farmlands. By the time we reached the most spectacular part in Montenegro the sun was already setting behind the mountains. We reached Podgorica by nightfall and I felt I had to leave the Montenegro express before the real show began. The Belgrade to Bar train runs twice a day. The Tara leaves at 09:21 from Belgrade to Bar and 08:20 from Bar to Belgrade. The nighttrain Lovcen leaves from Belgrade to Bar at 21:21 and from Bar to Belgrade at 19:00. The journey takes around 11 hours. Check the man in seat61 for the most recent timetables. Tickets cost 21 to 24 euro one way. For the nighttrain you should add 6 euro for a reservation in a couchette. The best scenery on the Belgrade to Bar train is in Montenegro, especially the part from Podgorica to Bar. Therefore I can recommend you to take the train from Bar to Belgrade. Alternatively, you can take the nighttrain from Belgrade to Bar in which case you get the best scenery once you wake up. The daytrains are a long and hot journey in the summer. If you want to break up your trip kathmanduandbeyond offer some interesting ideas where to stop along the way. Like I said before, the Belgrade to Bar train is no luxury affair. Our first class coupes had soft cushioned chairs and was theoretically shared with 4 other people. However, the train was not full so there were only two other people during our trip. There was airconditioning, but this broke down frequently. Each compartment has toilets at the front that were ok.
Bring enough food, snacks and water with you for the 11 hour journey. There is a cafe bar selling snacks, but what they have on offer is limited. Also keep in mind that there could be delays. If you leave from Belgrade there are some bakeries (pekara) near the station selling delicious breads. The pita’s filled with cheese or spinach are delicious and perfect to bring along on the Montenegro express. Also bring toilet paper or wet wipes as these are not guaranteed in the toilet. The Belgrade to Bar train is one of the safest ways to travel between Serbia and Montenegro. However, it is better not to leave your luggage unattended as opportunity theft in the train can happen. The Belgrade to Bar train was part of a bigger trip in the Balkans that started in Belgrade. To read more about everything there is to see and do in the great city of Belgrade, please read my post about Belgrade.